Kathryn Sytsma’s “viola consciousness” was raised in Hillsboro, Kansas, in 1963, when the Tabor College string ensemble played a Coperario Fantasia — and was reinforced soon after upon hearing Barbara Mueser’s beautiful playing. At UCLA in 1968, she studied viola with Mary Springfels (then of N.Y. Pro Musica). While working on her Master’s in ethnomusicology at UCLA, her performing career took off: in California (including Earls Court Players, Musica Pacifica and the Carmel Bach Festival), Chicago (Collegium with Howard Mayer Brown and with Ken Slowik on WFMT), Toronto, and New England. Main viola teachers have been Catharina Meints of Oberlin Conservatory, and the late August Wenzinger and Peggy Sampson. Kathryn and her husband John, a recorder player and retired psychiatrist, enjoy playing early music, church music, and Celtic music with Talisker together. 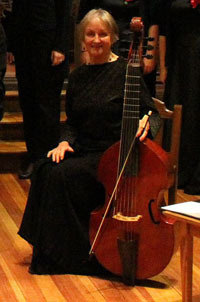 She has been an active piano and viola da gamba teacher in the Farmington area since 1985; she gave a piano recital at Nordica Auditorium at the University of Maine at Farmington in 2014, and she has been organist and/or choirmaster at St. Luke’s Episcopal Church in Wilton, Maine since the late l980’s. Presently Kathryn performs with St Mary Schola and Musik’s Quill.